Q 1. Welcome home from your Nepalese adventures Prof. Doebel. Looking back can you sum up your experience in one sentence? Ans 1: Not really. Because I don’t know where to begin. There were so many great experiences! However, if I am forced to say only one sentence… It would be that I am touched by the genuine happiness and politeness of everyone I met. Nepalese people are just wonderful people. Q 2. Before your trip did you have any preconceived notions about Nepal? Ans 2: Yes. I expected to see the Himalayas. And I thought I would learn a lot about Buddhism and Hindusim. I also knew that Nepal is a very poor country. As a matter of fact I found out later that it is ranked 20th in the poorest countries. And taking that into consideration I was astonished to see how truly happy and content people are… it’s just mind blowing. Whether it was someone who owned a little street shop next to a running sewer or if it was the owner of a hotel… I never heard anybody arguing. One preconceived idea that I did have was about my categorical objection to arranged marriages. That has actually changed a bit and it’s so funny to look at my own little evolution there. The way it is practiced today is very different (in Nepal)… that both bride and groom have a right to say no and the family and friends can go for another bachelor search. I think there is nothing wrong with that. Going beyond the superficiality of love… people do that today on online dating… “professional woman making $100,000 or so a year, family-oriented, cultured etc etc” and here the family does it. Personally I am way too much of a romantic [laughter] but forget it it doesn’t work in the long run. So there might be no harm in adopting the arranged marriage route. Q 3. You are very well traveled and given your German roots and American education how would you describe Nepal’s culture? Ans 3: I think I sensed that people support each other more than they would in America or Germany. Despite the presence or over presence of religion I felt like they had a very open mind. They were not stuck in any ritual but they also accepted other ideas and were very tolerant. But they certainly have to learn (and that is just my western upbringing) to create more equality between the sexes. Even in educated circles I noticed that women are treated more differently than men and that bothered me. That part of the culture I do not accept. It is certainly way way different. From a macho man point of view it might be all wonderful but I think it’s wrong. However, I also understand that lifestyles develop and improve based on literacy levels, urbanization and other factors. Other aspects of Nepal include the breathtaking topography. It was beginning of the monsoon season when I was in Nepal and for the four weeks I was there I didn’t see the moon or stars once. It was cloudy all the time. Although, when I went to Pokhara It was absolutely spectacular. The 7,000 – 8,091 m Annapurna peaks were all snow covered. Moreover, something as simple as the lushness of the rice paddies looking a little greener or seeing women in traditional and colorful dresses is awe-inspiring. I observed that Nepal’s culture exhibits a lot of community building. When people work in the fields (in the rural areas) it is a joint effort like a community working together and is means of social interaction so that is pretty cool. A little side note is that many of these subsistence farmers are women because their husbands are working in other countries (like the Gulf States) and sending them money back… even on construction sites women were doing work. Q 4. Nepal has a diverse linguistic and ethnic heritage and different factions and types of people reside in the mountainous nation. Could you elaborate more on the interaction with Nepalese people? Ans 4: The ethnic diversity becomes apparent after one has been there for a while. There are about 102 castes and ethnic groups in Nepal. They all speak various languages in various dialects. Even before India, Nepal tried to abolish the monarchy but people still point out that they are of a higher cast. Social categorization exists in mostly all South Asian countries. Weddings have a lot of hired musicians and dancers who are from a different ethnicity coming from the mountainous and hilly areas who attend functions like weddings to earn a living. Nepalese people are serious negotiators. I tired to avoid bargaining but in shops and stores one needs to be prepared to sit down, smile and possibly get offered a cup of tea which would make the bargaining experience enjoyable. But don’t expect to buy an item in 3 minutes and be out of there. If you have to bargain you need to spend your time doing that. So I probably figured that they would have something in mind to lure me in. [laughter] I had to propose counter prices and psychologically manipulate the set price. When I contended to give less than half or half of what they asked they were quite happy still. They were conventionally trained to lament over the little money they make by the things they sold you. It always left me with a little bit guilt and I asked myself did I really make them not earn enough. That was my worry in a way as I certainly could afford the full price. I felt like a typical foreign tourist. Despite the low per capita income the hospitality of Nepalese people is just fantastic and I was invited to so many places for lunch, tea and dinner. 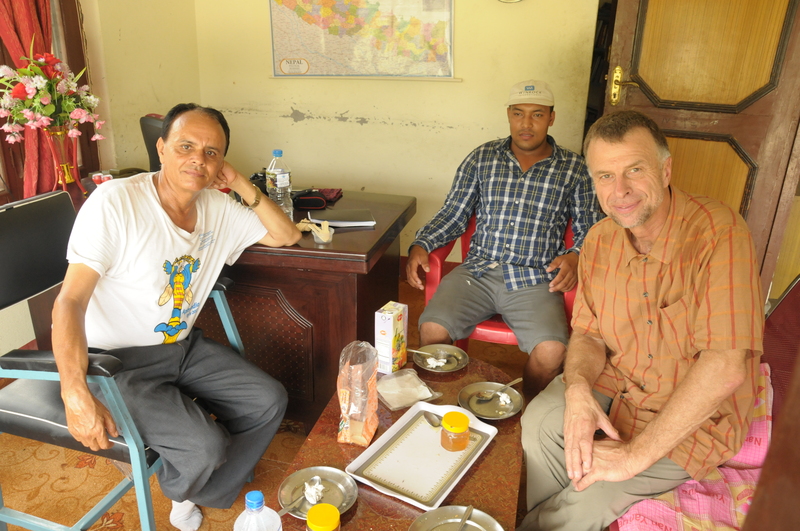 Even strangers in Lumbini, Pokhara had no qualms in opening up their doors and welcoming me into their world. The owner of the hotel I stayed in spent two hours chatting with me and he told me to go for a walk with him. So there I was all on my own, in a unfamiliar surroundings, going for an adventure with a stranger I met the same day. We hired a boat and coincidentally a woman rode us to the other shore where there was a trail at an altitude of 300 m. The Nepalese gentleman might have been only a few years younger than me but he displayed such strength and stamina all the way up the trail whereas I was sweating and breathing heavily. We passed by a little restaurant on the way up where I wanted to buy water. As I was about to purchase two bottles he said one bottle is enough, we can share. That was amazing. When we reached the top I realized that the hotel owner had brought me to Shanti Stupa – a world peace pagoda which was a shrine symbolizing peace. 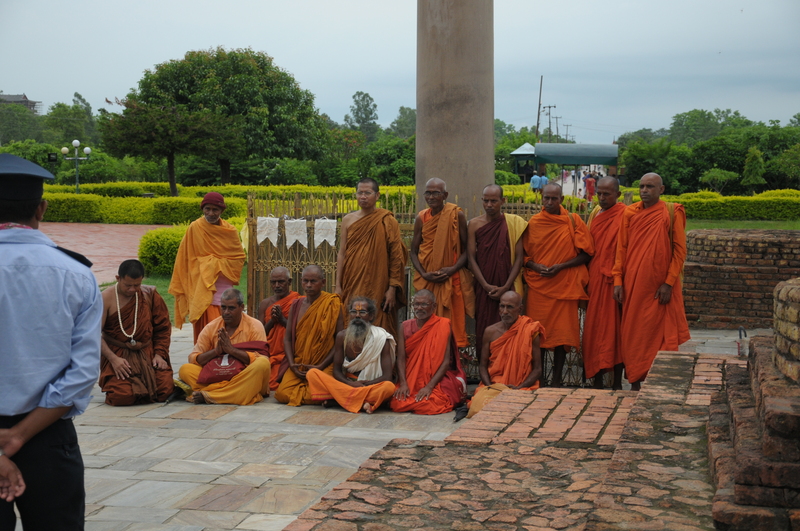 It is also the birthplace of Lord Buddha. After WWII a group of Japanese Buddhists decided to raise money to build about a 100 world peace pagoda in significant places all over the world. There are actually 2 in the US and I want to visit them. So that interaction with the Nepalese hotel owner was indeed a very interesting one. Then we sprinted down and that was that. A random act of kindness in play. Q 5. Did you learn any Nepali, Hindi or Urdu words? Ans 5: Yes a few. I know ‘dhanyavad’ means thank you. And… oh… ‘namaste.’ You have to say that all the time. [laughter] I know a few numbers. I can buy water in Nepalese! I figured if I need something I can just go to a little store. I didn’t want to buy anything from the hotels as they already make so much money so I found myself exploring the little bazaars in every city I visited. I had a little language book with me but I didn’t have enough time to go through it in a systematic fashion. For better or for worse I got by with English words because everyone knew some English which was good. Q 6. What is the most striking thing about Nepal? Ans 6: The people. I just have to say the people. I would have said that nature is the most striking thing but no it’s the people. Being social myself I was truly struck by how wonderful, nice and helpful people in Nepal are. Even if a few people were begging on the roads other Nepalese people would give them some money and there was a constant stream of rupees showing how everyone supported those that were not well off. That impressed me quite a bit! I cant say enough about the goodness of people in Nepal. Q 7. Nepal has an array of altitudinal belts and subtropical forests making it the foreground for budding agriculture and forestry endeavors. You were hosted by the Agriculture and Forestry University in Rampur, Chitwan Valley and the institution seems quite promising for sustainable conservation/development teaching and life sciences education. What are the differences and/or similarities in style of teaching, curriculum and education in Nepal? Ans 7: I don’t even know where to begin. First of all AFU is a new university formed by the fusion of two institutes. Therefore they have only hired about 30 to 40 professors from their 200+ faculty positions. In one way teaching is very similar when it comes to the professor standing in front of students and giving lecture. Although the labs still need improvement and equipment. All lectures are in English expect every 5 mins or so the prof speaks Nepalese and then goes back into English so that the students understand better. So a bilingual teaching approach is adopted here too. The university has a tremendous acreage of land – rice and corn fields… I mean its amazing that the university has many, many hectares of agricultural land to facilitate their field teaching. Most of the students I have talked to come from agricultural and rural areas. They dream of a better education at AFU which is very affordable for them. The students I encountered were ambitious and eager to earn their masters or possibly Phd degrees and they were quite curious as to what I was doing at AFU. So they joined workshops about my work there which was a good opportunity for them. Another thing that I noticed was that the professors were not paid enough. They all had to sustain themselves and their families which is why mostly all the staff was also engaged in a multitude of activities outside academia. In my opinion it poses a possible conflict of interest – what to prefer or give more attention and time to… teaching or running a side business? I feel that needs to be sorted out in a developing nation like Nepal. The University is run by the Vice Chancellor under the supervision of the Chancellor (the president of the country). I met with the Vice Chancellor who was rather eloquent and very excited to expand apiculture programs in the country and to have AFU be a part of it. Next level down the Dean was also very supportive about doing something with bees since they increase honey production. Ideas like selling honey to the European Union were also voiced. But Nepal would need funding to adopt modern beekeeping methods and equipment to meet international standards. Q 8. What was the primary purpose of your visit? 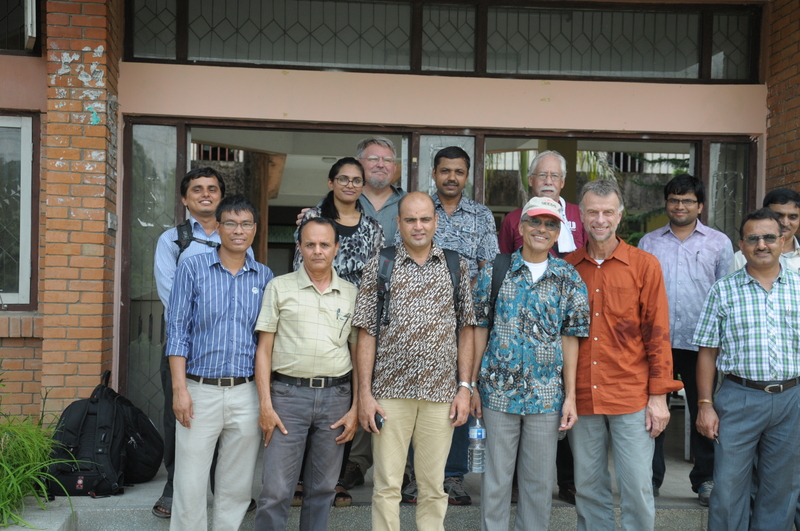 Ans 8: The primary purpose of my visit was to develop two programs in apiculture at AFU. One for the Bachelors and one for the Masters level. I struggled to understand having a Bachelors course dedicated to solely beekeeping since we do not have something like that in the US. But in Nepal they are striving to have a major in apiculture at the Bachelors level as well. In the beginning I felt that it was too narrow of a subject to be taught at the Bachelors level. But it finally resonated with me when I found out how important honey is. There is not a store large or small were you can’t find honey to buy in the bazaars. It is always there. For us in the US (or in Germany) honey is just a by-product. 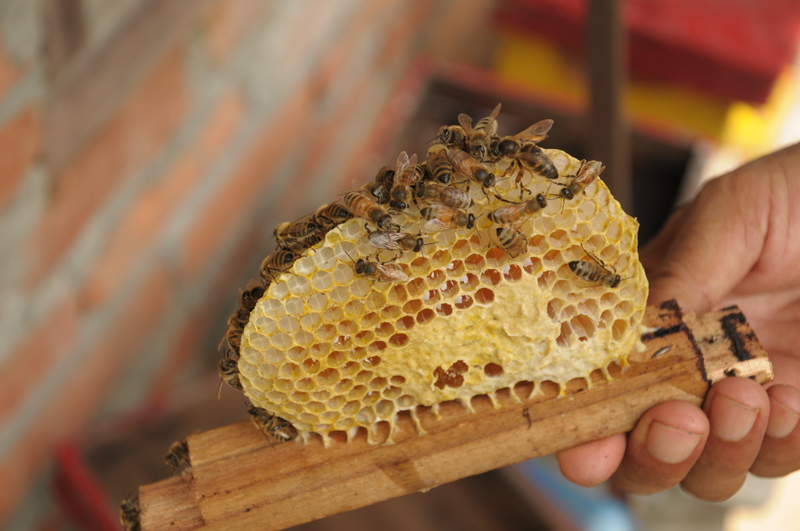 We consider honeybees as pollinators but in Nepal honey is actually a primary product and is a source of revenue for subsistence farmers. So I understood why the university wants to expand on that venture. Q 9. How did you formulate the curriculum for the Bachelors/Master’s Degree Apiculture programs? Ans 9: I wiggled my space and thoughts in there. I have outlined courses in the curriculum that are about evolution of bees, about pollination and about ecology. Courses on diseases of bees, queen rearing and production/development of bees were also incoorporated. We also deliberated that including courses are offered at Bachelors and Masters levels in the US would be beneficial in Nepal too. So the students would have to take some organismal level biology classes and labs. A course on the phylogenetic approach in the evolution of bees and their relatives (not just honeybees) is very important. The floral ecology courses are about all of the flowering plants in Nepal and the pollination course is when and how pollinators pollinate. There was also a course on conservational biology so that the students learn about how to protect native pollinators in Nepal. My colleague, Khem Raj Neupane (Associate Professor and the Chair of the Dept of Horticulture at AFU) is also a trained entomologist who runs a bee product business with 300 beehives – he sells all types of bee products, lip balms, skin care, anti wrinkle creams you name it. 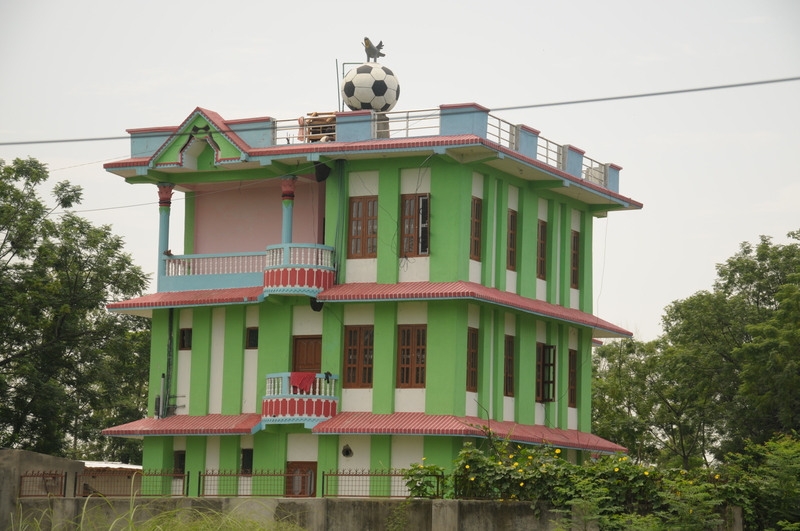 His store and business Gorkha Bees is right on a major highway outside of Bharatpur. So Khem supported me a lot! I did not do it all alone. He and I worked on the development of the curriculum together, often criticizing and giving each other constructive feedback. Q 10. In your opinion what is the beekeeping potential in Nepal? What resources can be improved on? Ans 10: They can really do much more with beekeeping as it is all done in a very haphazard fashion and the Nepalese want a 50% increase in honey production throughout the country. I would enforce that more training and planning on part of the beekeepers is required which would improve their efficiency. The issue of local farmers not accepting beehives and beekeepers on their land in fear of competition needs to be dealt with appropriately. There should be an extension of agricultural apiculture programs that can be established by the University – that every one of the zones, districts and regions in Nepal can arrange to have an apiculture office offering workshops and encouraging the expansion of local apiculture. Training can start at AFU and they should make district offices to expand beekeeping endeavors nationally. In order to achieve such a large scale goal government involvement is imperative. The problem comes with the detriment of the native honeybees there. Khem sent me a 4 year grant proposal to improve the honey potential of Apis cerana (Asiatic honeybee) in order to support the native bees and to get people to use them instead of the exotic Apis mellifera (European honeybee). I understand that Apis Mellifera can produce 30 kg honey/hive/year whereas Apis cerana only produce 3 kg honey/hive/year but Apis mellifera has negative effects too. At the current moment there are no signs of colony collapse disorder in Nepal but frequent use of exotic species of honey bees like the European honey bee can induce colony collapse disorder in Nepal and that would certainly be a big problem globally too. Q 11. After a palynological overview of Chitwan Valley’s (the region where the apiary was) environment and the Nepalese honeybee fauna, do you feel that environment (quality of air, atmosphere, external factors) plays a role in the quality of honey being extracted there? Ans 11: Yes! I was told in many meetings on several occasions that the honey in Nepal does not meet WTO standards and needs rigorous improvement. One aspect of that is to increase or improve the hygiene of honey harvesting and extraction including packaging but another aspect is also to get farmers better educated regarding use of pesticides as pesticides may show up more in honey in Nepal. Therefore the quality of honey can be improved but it takes a lot of education and the district offices (which I mentioned previously) can help a lot with this. Regulations on pesticide control should be enforced too in order to stop illegal trade of pesticides from neighboring countries like India because usually farmers are under the impression that more is better. And that using more pesticides would benefit their crop but it actually produces adverse effects. Q 12. Since South Asian countries like Pakistan and India (including Nepal) are primarily agrarian you might have noticed rural beekeeping as opposed to urban beekeeping, whereas during your brief stay in Germany (on your way back) the beekeepers were more advanced in their equipment and techniques. Keeping the two divergent lifestyles in mind what can American beekeepers take away from Nepalese and German beekeeping perspectives? 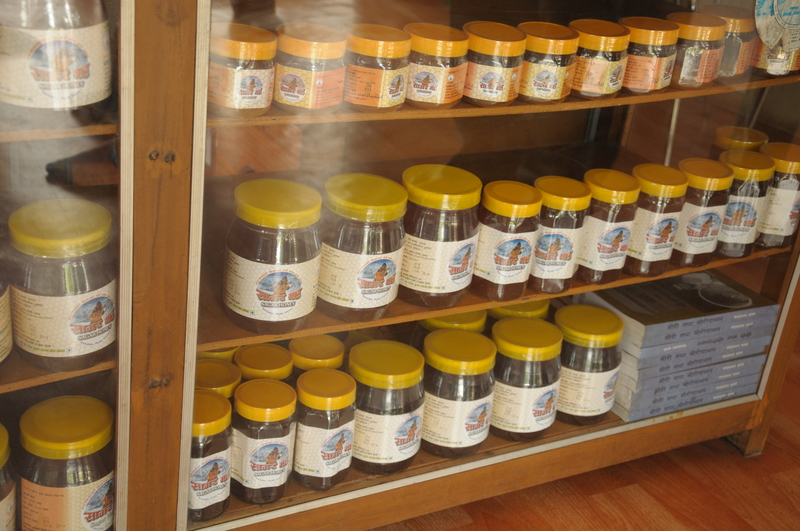 Ans 12: I think it was extremely interesting to see how honey is valued in Nepal (even more than in Europe). I think honey is not considered that important in the US. Overall people lean towards supermarket or store honey as opposed to getting honey from the farmers markets or from actual beekeepers. But it Germany everyone buys honey from beekeepers! In Germany and in the US the awareness of the crucial role of honeybees as pollinators is so much better than in Nepal. People there need to understand the role of honeybees as pollinators. I think all countries especially Nepal and the US can learn from the stringent laws of the European Union – as I saw in Germany that farmers who apply pesticides on crops have to be trained through yearly workshops and on a biannual level they need to have their equipment inspected and lose their government subsidies if they the quality is below standards. The beekeepers I met in Germany were very optimistic about the idea that the government will extent the two year moratorium restricting the use of neonicotinoids. There is a lot of research about neonics in pesticides being the main cause of bee mortality. What we can learn from Nepal is to remind ourselves that honey is an important dietrary resource. Sometimes we forget about the roots of beekeeping – a 1,000 years ago we didn’t know how to beekeep properly but we always treasured the honey so that is something special. 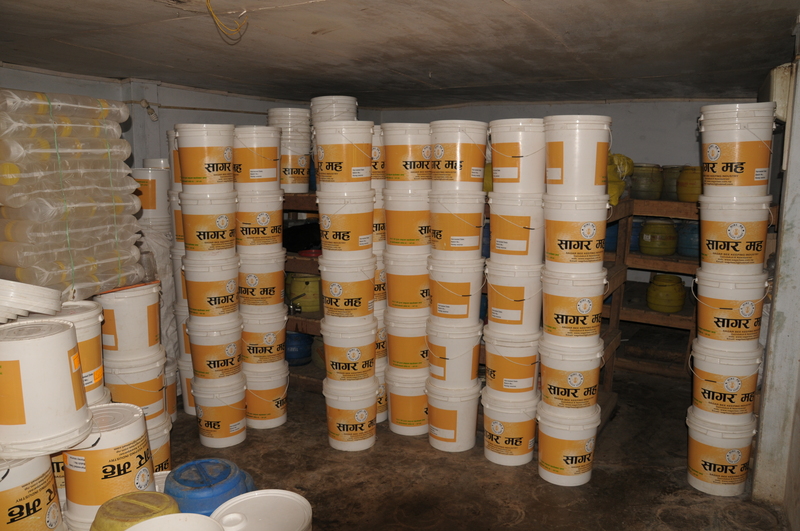 Moreover there is a lot of pesticide residue in Nepalese honey. And I think the most we can learn from the European Union is to reduce pesticide use. Q 13. Nepal is the birthplace of (Siddhartha Gautama) Lord Bhudda. 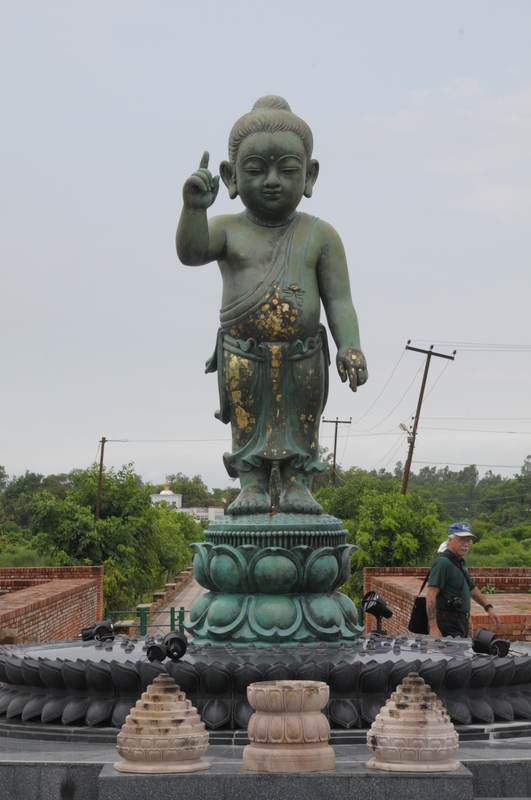 How was your visit to Lumbini? Did you feel enlightened by the Buddhist practices of meditation as a means of changing oneself in order to develop qualities of awareness, kindness, and wisdom? Can those teachings be applied to the art of beekeeping and apiculture? Q 14. What message would you like your students to take away from your Nepalese escapade? Ans 14: If you can afford to travel and have the opportunity to travel find countries that are very very different to our cultures. They will make you think differently and make you appreciate what you have and it is a great learning experience. Going from Germany to the US there is no culture shock but US to Nepal was a culture shock in a very good way. Take time, see the world and start talking to different people with different opinions and listen and observe. Little things will make you smile. It is certainly nice to walk on a road with no sidewalks and not being run over by cars… its fun to notice that people are not texting there in the cars! Q 15. If you were to go to Nepal again would you? What would you change/not change about your stay? Ans 15: I would definitely go again. In fact I would love to go again but I would like to have some extra time to fully explore the mountains. I would want to visit Nepal again with more knowledge of the language… even if I used limited Nepalese words it just opened up more hearts in the people as opposed to when I said English words in my German accent. I wish I could learn the language a little bit better so as to converse with the locals. It is also amazing to see that I have already gotten emails from 4 locals I had met in Nepal. I also wish I had brought gifts! I was not prepared for that. That was pretty dumb and selfish but that is something that I would change.10 year old kids walked up to me asking whether I had American chocolate and I had to say no I am sorry I don’t and I felt like an idiot afterwards. They really love are chocolates… German, US or whatever kind… but just chocolate! I wanted to give them big jars of chocolate. Next time. I definitely will. Q 16. Who would you like to thank in Nepal? Ans 16: I would like to certainly thank the Usaid office who helped me find my footing in the country, escorted and drove me to meetings and these wonderful places. I’d like to thank my delightful driver Krishna who was always patient and joyous. Then certainly my colleague Khem Neupane and everyone at AFU. A huge shout out and thank you to the people of Nepal and to the overall hospitality of the country. You might be tired of hearing me say this but the people are simply nice. They were so friendly. We all laughed. And as a matter of fact I was so relieved when I figured that they also have a sense of humor akin to mine! I could tease and joke around with them (as I do all the time) and most people understood my witticism! And I actually learned from many of the people that one should not take things so seriously in life. Nepal was great. I definitely want to go back there. ← ANIMAL ARCHITECTURE AT ITS FINEST. Fascinating! Thank you for telling us about your trip. 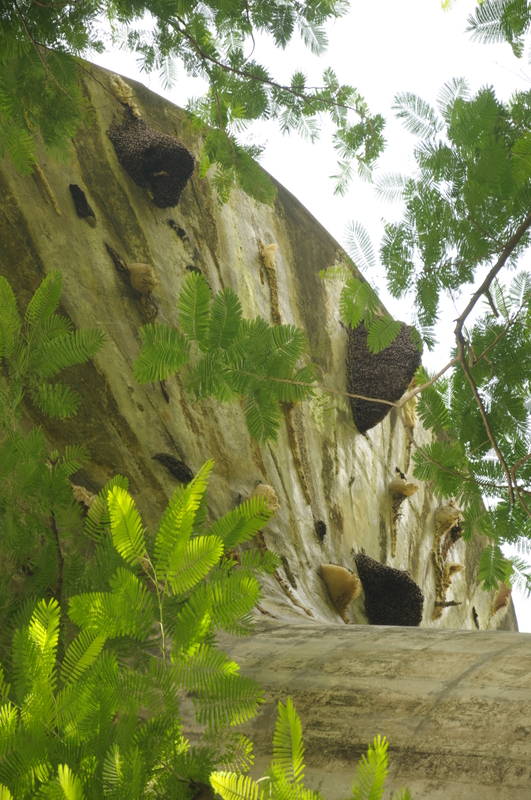 Can the Apis cerana bees be kept in hives in the same way as Apis mellifera?